Mr. Ronald Davis has an extensive management background with over thirty-five years experience in a variety of executive management positions in the public and private sectors. As a former City Manager in Riviera Beach, FL and Assistant City Manager in West Palm Beach, FL, Ron gained valuable local government management and community/economic development experience in South Florida. While serving as Senior Assistant for Community & Economic Development Policy to former FL Governor and U.S. Senator Bob Graham, he researched, developed, and managed numerous statewide community redevelopment initiatives. Additionally, Ron served as Assistant Superintendent for Business Affairs for the School District of Palm Beach County, Deputy Director of Finance and Revenue for the District of Columbia Government (Washington, DC), and Assistant to the City Manager in Inkster, MI. In the corporate sector, Ron has managed corporate divisions with responsibility for real estate and development, business development, marketing, management consulting, and governmental relations. His experiences include Managing Director, D.J. Miller & Associates in Washington, DC; Vice President, Infrastructure Management Group in Bethesda, MD; Executive Vice President for Real Estate, Capital Asset Research Corporation, Palm Beach Gardens, FL; Executive Vice President, Dominion Developers, Miami, FL; and Senior Vice President, Hardie Industries, Inc., West Palm Beach, FL. He is the Founder and President of Mosnar Group, LLC, a West Palm Beach based real estate development and advisory firm. 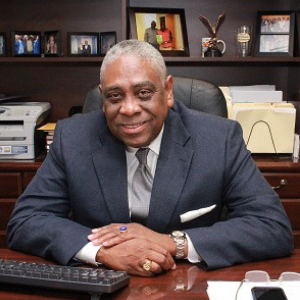 In addition to his business commitments, Mr. Davis also serves as on the Board of Trustees, New Bethel Missionary Baptist Church in West Palm Beach, FL; Board of Directors, Palm Beach County Business Development Board, and Chairman of the Board, Northwest Community Consortium, Inc. and a member of Omega Psi Phi Fraternity, Inc.
Ron received a B.A. degree in Business Administration from Morehouse College and earned a Masters degree in Public Policy from the University Michigan. He is the son of Arthur L. and Alethia R. Davis of West Palm Beach and has one son, Ron II, two grandchildren (Tobias and Zaria), a deceased brother (Arthur L. Davis, Jr.), two sisters (Patricia Davis and Sandra Davis Mapp), and two adopted sons (Alcee Walker and Travar Dixon).